Fabric can be removed and machine-washed. Seat fabric can be slipped off to bathe a child sitting on the floor of the tub, supported by the bath chair back. The soft fabric is polyester knit and provides greater comfort. The extra padding between fabric and frame softens surface contact. Seat and back are angle adjustable and have five angle adjustments at 0, 22.2, 45, 67.5 & 90. Adjustable slip-resistant legs raise chair up to 7". Height can be adjusted with child in chair. Uni-Bars allow seat and back angle adjustments to be made with one hand. Head cushions are height and width adjustable and provide support and comfort. They can also be used as lateral supports. 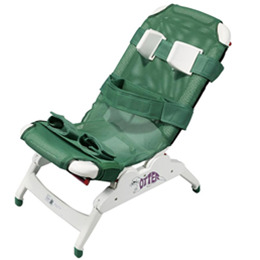 The outer trunk strap goes around user's chest and the side straps allow for secure lateral positioning. Leg straps can be adjusted around the user's legs. All straps can be removed. Adjustments can be made with user in chair.